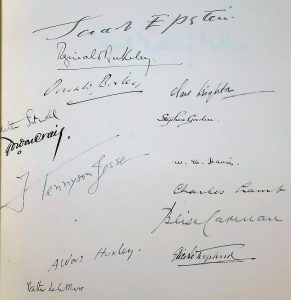 Imagine a book so rich in signatures that Winston Churchill’s autograph is barely of note. 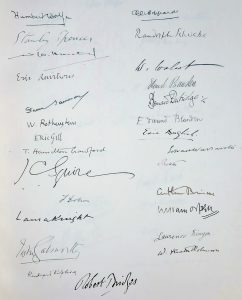 Q: What would it take to secure the signatures of 85 leading lights in British literature and the arts, as well as four prime ministers, in a single volume? A: It took a World War and a future King of England. The British Empire alone suffered more than 900,000 dead and two million wounded. At the end of WWI, the pension for a totally disabled man was only 30 shillings a week and no claim could be made seven years after discharge. In May 1921 several ex-servicemen’s organizations were amalgamated to form the Royal British Legion. Thereafter, the Legion actively involved itself with employment and pensions for both able and disabled ex-servicemen or their dependents. These hundred were simply magnificent – printed in red and black by The Curwen Press on larger, hand-made paper, profusely illustrated, extravagantly bound in elaborate blind and gilt-tooled white pigskin. Massive volumes, they measure 13 x 10 x 2 inches and weigh 6.6 pounds. Each copy was hand-numbered. As impressive as the aesthetics are, more impressive still are the signatures. 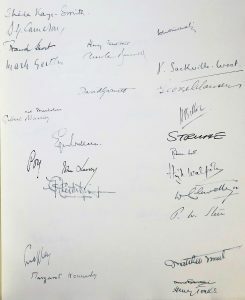 These 100 magnificently bound copies were signed by a simply remarkable list of 85 writers and illustrators, as well as four prime ministers (three British Prime Ministers – David Lloyd George, Stanley Baldwin, and Ramsay MacDonald – and French Prime Minister Georges Clemenceau), and H.R.H. The Prince of Wales. 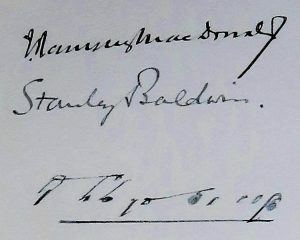 The tally is five prime ministers if you count Churchill, who signed as a contributor, but became prime minister in 1940. So many are the signatures that they span 8 pages. 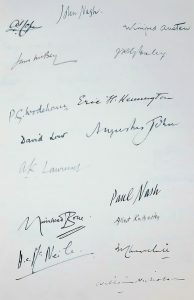 As stated at the end of the contents: “There are five pages of contributors’ signatures following the Dedication, one page opposite Collotype No. 3 and one page opposite Collotype No. 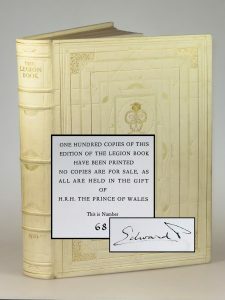 20.” The Prince of Wales signed on the blank verso of the Dedication. 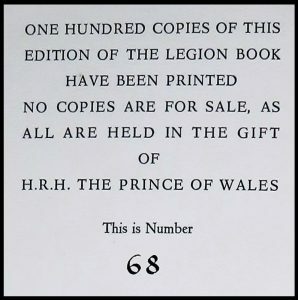 We will soon be pleased to offer an unusually fine example, copy “68”, hand-numbered thus on the limitation page. The binding and contents are nearly flawless. 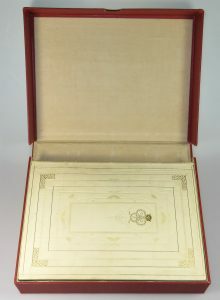 Superlative condition owes to the presence of the original felt-lined cloth clamshell case, with a discreet, inked “No.68” on the upper front cover. 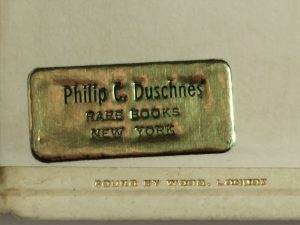 Laid in the case is an original description of this book by noted New York bookseller Philip C. Duschnes, who died in 1970. His tiny gilt sticker is affixed to the lower rear pastedown. This is another installment in our preview of hoarded treasures being reserved for our forthcoming “Extra Ink” catalogue. Expect the catalogue in final weeks of 2018. During the coming months our blog posts will provide a sneak peek at some of the catalogue items! This is another installment in our preview of hoarded treasures being reserved for our forthcoming “Extra Ink” catalogue. Expect the catalogue late in 2018. During the coming months our blog posts will give you a sneak peek at some of the catalogue items. 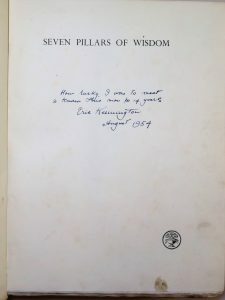 Today, a first trade edition of Seven Pillars of Wisdomrendered special by a poignant inscription by Eric Kennington, the man who created thirty-one of the illustrations within its pages. 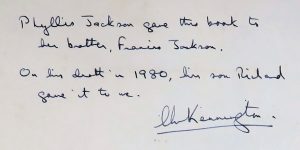 Inked in blue in four lines on the half title, Kennington wrote: “How lucky I was to meet | & know this man for 14 years | Eric Kennington | August 1954”. 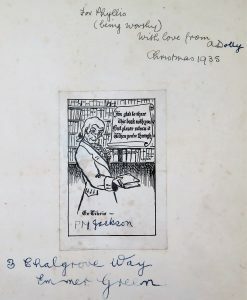 A gift inscription “For Phyllis” dated “Christmas 1935” is inked on the front free endpaper above the illustrated book plate of “PM Jackson”. 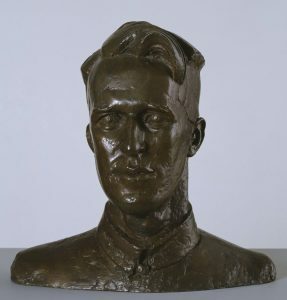 Eric Henri Kennington (1888-1960) was known as a painter, print maker, and sculptor and, most notably, as “a born painter of the nameless heroes of the rank and file” whom he portrayed during both the First and Second World War. Badly wounded on the Western Front in 1915, during his convalescence he produced The Kensingtons at Laventie, a portrait of a group of infantrymen. 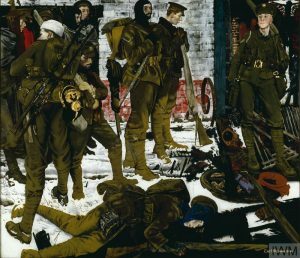 When exhibited in the spring of 1916 its portrayal of exhausted soldiers created a sensation. Kennington finished the war employed as a war artist by the Ministry of Information. 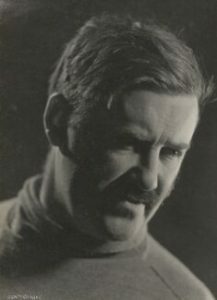 After the war, he met T. E. Lawrence at an exhibition of Kennington’s war art. 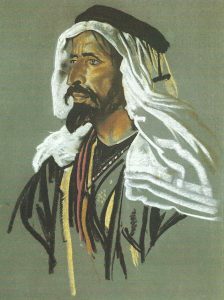 In 1921, Kennington traveled to the Middle East with Lawrence where, Lawrence approvingly wrote of his work, “instinctively he drew the men of the desert.” Kennington served as art editor for Lawrence’s legendary 1926 Subscribers’ Edition of Seven Pillars of Wisdomand produced many of the drawings therein. That same year he produced a bust of Lawrence – an image of which is the frontispiece of this book. On 15 February 1927, Lawrence wrote to Kennington praising the bust as “magnificent”. Lawrence said “It represents not me, but my top-moments, those few seconds in which I succeed in thinking myself right out of things.” In 1935, Kennington served as one of Lawrence’s pallbearers. 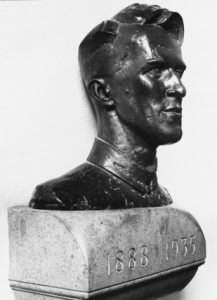 In 1936 his second, memorial bust of Lawrence was installed in the crypt of St. Paul’s Cathedral. Kennington was again an official war artist for the British government during the Second World War (Ministry of Information and Air Ministry), producing a large number of portraits of individual soldiers in addition to military scenes. Kennington died a member of the Royal Academy six years after writing the inscription in this book. 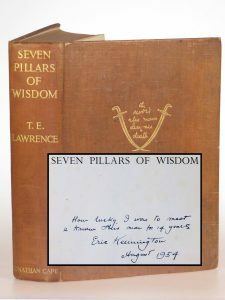 Seven Pillars of Wisdom, with which Kennington became integrally linked, is the story of T. E. Lawrence’s (1888-1935) remarkable odyssey as instigator, organizer, hero, and tragic figure of the Arab revolt against the Ottoman Empire during the First World War, which he began as an eccentric junior intelligence officer and ended as “Lawrence of Arabia.” This time defined Lawrence with indelible experience and celebrity which he would spend the rest of his famously short life struggling to reconcile and reject, to recount and repress. 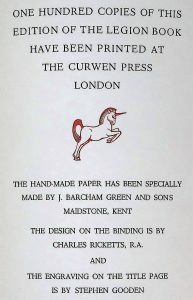 Kennington first produced illustrations for the 1926 “Subscribers’ Edition” of which fewer than 200 complete copies were produced. 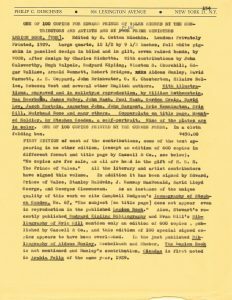 It was only in the summer of 1935, in the weeks following Lawrence’s death, that the text of the Subscribers’ Edition text was finally published for circulation to the general public in the form of a British first trade edition. 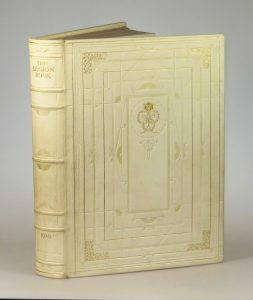 This copy inscribed by Kennington is the first printing of this British first trade edition. Condition is good, showing the aesthetic flaws of age and wear, but sound. 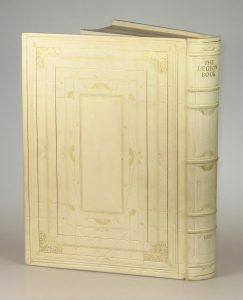 The khaki cloth binding is square and tight with wear to extremities, overall soiling and staining, and considerable scuffing to the rear cover. The contents are clean with toning to the page edges. A tiny Colchester bookseller sticker is affixed to the lower rear pastedown. Look for this and dozens of other signed or inscribed items in our “Extra Ink” catalogue late in 2018!